The US is escalating its war on the planet. 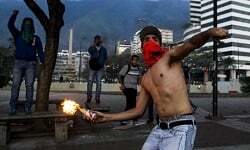 In Venezuela the fascists have escalated their war on the country committing gruesome murders, and attempting to burn down government buildings. In Syria the US continues to expand its invasion from the south and the north bombing Syrian forces and shooting down a Syrian jet as part of their campaign to steal as much Syrian territory as possible. In better news Brazil a victim of a soft coup last year that deposed the democratically elected president Dilma Rousseff the new puppet president Temer is on the verge of falling from power. In the Philippines the US is doubtless behind a sudden uprising by ISIS. The middle east is in chaos with Saudi Arabia turning on its frequent ally and fellow terror sponsor Qatar. Obviously it is difficult to decide which of the two is worse although their current conflict is due to Qatar’s monarchs being slightly less insane then the megalomaniacal Saudi monarchs. Now Saudi Arabia has had its own soft coup elevating a war mongering prince Mohammed bin Salman aka the “Butcher of Yemen” to the role of heir apparent Crown Prince to the senile current monarch. In Yemen the blood bath and starvation continue. Iran suffered a major ISIS attack and the CIA have launched another attempt to topple the government. Across the planet World War 4 rages from Mexico to Colombia, to DR Congo, England, Afghanistan, a war without boundaries or borders bringing poverty, misery, death, and destruction, fear, sadness, tragedy and sheer horror. Billions of people struggle to survive in our doomed world. Wherever there is hope or heroism the empire of chaos moves in to try to destroy it. Venezuela is a beacon of hope to the world. In 1989 Gorbachev was destroying the socialist world to the applause of the west who declared an end to history. The people of Venezuela, the people of the slums, the poor, the desperate rose up, demanding a better future. They were brutally massacred between 300-1500 people were killed. However in response to this horror and to the cries of the people that revolutionary genius Hugo Chavez began to make his plans and after a failed attempt to seize power he would by 1999 be elected president of Venezuela. Hugo Chavez would set about transforming Venezuela forever. He gave hope not just to Venezuela but to all of Latin America, in fact to the whole world. He was killed by the CIA but his revolution would live on. Venezuela has been constantly targeted for destruction since Hugo Chavez came to power. For the empire of chaos it is criminal to dream of a better future and still worse to inspire others to dream. Thus the war on Venezuela has been escalating. Spoiled rich kids have received paramilitary training so that they can wreak havoc on their country. Among their most memorable recent crimes was the murder of Orlando Figuera who was stabbed six times and burned alive for being a black man and hence a likely Chavista. I was reminded of the CIA’s war on black Libyans who were massacred by racist al Qaeda death squads incited by “human rights groups” like Human Rights Watch and Amnesty International to carry out genocide against black Libyans and African guest workers with their “African Mercenaries” propaganda campaign. I was also of course reminded of the US itself where the police and even fascist hate groups still murder blacks with utter impunity. Ines Esparragozza Orlando‘s mother a maid was fired by her rich opposition supporting employer for daring to denounce the horrific murder of her son on national television. The murder of Orlando Figuera had been part of the oppositions Ukraine inspired tactics as earlier a Telesur journalist had been doused with gasoline and nearly set on fire. Arson is a favorite weapon of the Venezuelan fascists who had already tried to burn down a maternity ward full of premature babies. Since torching poor Orlando alive they have attempted to burn down the Venezuelan Supreme court for resisting their coup plots and the housing authority for the crime of building new homes for 1.5 million Venezuelans. To make matters worse Colombian death Squads are still operating in Venezuela murdering Chavistas. The CIA/Media which are practically inseparable have waged propaganda warfare on the country. Apparently Venezuela is guilty of trying to put a stop to this violent and murderous rampage which no state would tolerate. 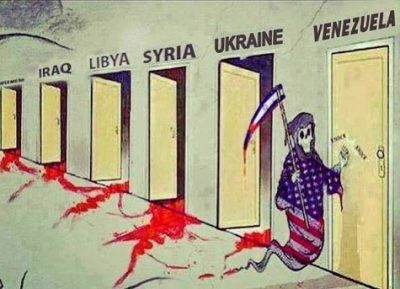 Venezuelans will never surrender to this attack on their country aiming to destroy all they have dreamed of and worked for in the 30 years since they first rose up. Syria the most heroic nation on the planet has been a target for even longer. As Stephen Gowan explains in his excellent new book “Washington’s Long War on Syria” Syria has been a target of the american empire since at least the 1950’s. Syria’s crime was daring to dream of true independence from the old colonial powers and their new american heirs. Syria attempted to achieve economic and political independence. Syria resisted the settler colonial state of Israel. Syria refused to throw it’s people into poverty so that western billionaires could get a little richer. 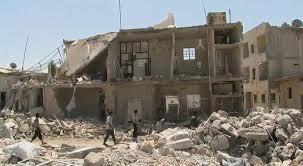 As result Syria was targeted for destruction. An attempt was made to destroy the country using the Muslim brotherhood as proxies in the 1980’s funded by the CIA, Israel, the Saudis and Syria’s many other enemies. Thankfully this genocidal terror campaign was successfully crushed. Sadly the US would launch a far more ambitious war on Syria in our own times. The suffering the Syrian people have undergone since 2011 is incalculable. The economic war using sanctions has been even more destructive then the terror campaign the west has unleashed. The two work together sanctions prevent Syria from importing vital medicines while the NATO death squads blow up pharmaceutical factories, destroy hospitals and murder doctors. Then when terrorists explode a bomb Syrian civilians die or suffer unnecessary amputations because there are no antibiotics to treat infections. A simple trip to the dentist becomes a nightmare because there is no anesthetic. Sanctions put people out of work while terrorist recruiters offer huge salaries. Children starve or die from easily preventable diseases. Millions have lost everything, millions are homeless. 300,000 people have died but millions have lost love ones, suffered traumas and tragedies most people cannot even imagine. Yet even amidst all this horror and suffering Syrians have refused to surrender. They have refused to give up their dignity their humanity. Syria’s civilians are the unsung heroes of this war every day is a struggle to survive. The criminal sanctions on Syria must be lifted. Which is why it is so horrifying to see the empire of chaos doing everything in it’s power to prolong this war as long as possible. Syria has suffered more then enough. The tide of the war has shifted in Syria’s favor forcing the US to intervene directly in order to prop up their terrorist allies. First however I must deal with that heroic city Deir Ezzor. The US seems determined to enable an ISIS victory. Deir Ezzor was the victim of repeated waves of huge ISIS attacks aimed at capturing the city leaving 100,000 Syrian civilians in ISIS merciless grip and massacring the cities heroic SAA defenders who have managed to resist ISIS for years despite being completely surrounded. The US has been deliberately trying to herd ISIS fighters out of Raqqah and towards Deir Ezzor and Palmyra which they hope to seize a third time. The SAA have been trying to close this gap in southern Raqqah which the americans kurdish mercenaries have deliberately left open. The latest attack on Deir Ezzor was enabled by these criminal schemes although of course ISIS would never have become one of the most powerful and well funded death squad armies without the support of the CIA. This fact was made blatantly obvious when ISIS popped on the other side of the world to destabilize the Philippines which is pursuing friendly relations with China against the empire’s wishes. Hence it is clear the US was also behind the massive ISIS offensive at Deir Ezzor which they hope will give them an excuse to seize Deir Ezzor using their Marines and kurdish proxies in the north of Syria and their terrorist forces in the south of Syria. ISIS managed to make some dangerous advances seizing vital strategic parts of the city and the fate of Deir Ezzor was in doubt for a few days. Thankfully the heroic SAA defenders were able to stage a counter attack and Deir Ezzor was saved. Deir Ezzor has become an important symbol to Syria and the world as a symbol of Syria’s determination to liberate their country. Deir Ezzor surrounded by enemies a symbol of Syria’s heroic resistance against the US-Israel-NATO-GCC Axis of Chaos. We can only hope that the cities brave defenders can hold out against ISIS long enough for the siege to be lifted and the cities people to be saved. The US has launched a horrific white phosphorous bombing in the area that killed 30 civilians. The liberation of Deir Ezzor has long been a goal of the SAA but recently a new battle to preserve Syria’s sovereignty has begun in the south where the US invaded a couple months ago in support of their terrorist allies and set up a base at al Tanf. When Syria and it’s allies sent a force aimed at ejecting the invaders the US bombed them repeatedly. The US then set up yet another base in southern Syria. They are moving kurdish mercenaries to reinforce al Tanf. They have recently sent an advanced rocket launching system to defend this stolen territory. Luckily Syria and it’s Iraqis allies were able to outflank these bases opening a border crossing between Iraq and Syria. Syria is doing everything in it’s power to contain this invading force without giving the Americans an excuse to further escalate their attacks. Unfortunately America needs no excuses since it is run by pathological liars. In Northern Syria the SAA are trying to cut off the ISIS escape routes and trying to prevent the Americans from stealing more Syrian territory for their kurdish puppets. In support of this mission a Syrian jet was bombing ISIS near Rasafa when the US shot it down aiming to halt Syrian advances in the North which are also aimed at setting the stage for the liberation of Deir Ezzor. The US lied and claimed the plane had been bombing their kurdish puppets. The US may have gone too far this time as the patience of Russia has finally run out and it is threatening to target any NATO or Israeli planes flying into Syrian airspace. Only the future will show whether they carry through on these threats. Thus unfortunately after suffering years of tragic war it may be years before the war in Syria ends because the vindictive empire cannot stand to be humiliated at the hands of the heroic Syrians. It is all just a board game to the imperial planners in Washington no matter how many millions they kill they seem completely immune to any remorse. If Syria had been destroyed and millions were slaughtered they would have celebrated. They dream of a world without heroism a world without hope where we have forgotten how to dream and would never dare to resist. A world where greed is the only value, lies are held to be sacred truths, and where mass murder and slavery are viewed as liberation. Opposing them are the millions of Venezuelans who have taught the world to dream, to hope again. Opposing them are the heroic people of Syria who have reminded the world that however powerful the empire it can be defeated so long as we resist. I read two great books recently which I highly recommend “The Plot to Scapegoat Russia: How the CIA and the Deep State Have Conspired to Vilify Russia” By Dan Kovalik (I’ve often relied on his work on Latin America) attempts to expose the horrifying crimes of the american empire as well as explain why Russia has been targeted by this insane propaganda campaign. I also recommend “Washington’s Long War on Syria” By Stephen Gowans which explains Syria’s modern history as well as analyzing the current war on Syria and debunking much of the propaganda surrounding this war. Both Books are must reads.